It's easy to adopt a gloom-and-doom attitude about the current state of the world. This year's first quarter was one for the record books: most of the Japanese coast was annihilated by a tsunami that continues to wreak havoc on a nuclear power plant, uprisings in the Middle East have become bloody battles between citizens and dictators, and a debt-laden United States that is in the midst of a political battle that will most likely end with deep and painful cuts and perhaps slow the fragile economic recovery. Not to mention spreading fears of rampant inflation and rising interest rates. In such times of high uncertainty it can be difficult to meet client's investment objectives, especially regarding income generation. How to best use closed-end funds for income generation in such uncertain times will be the topic for representatives from leading CEF providers. 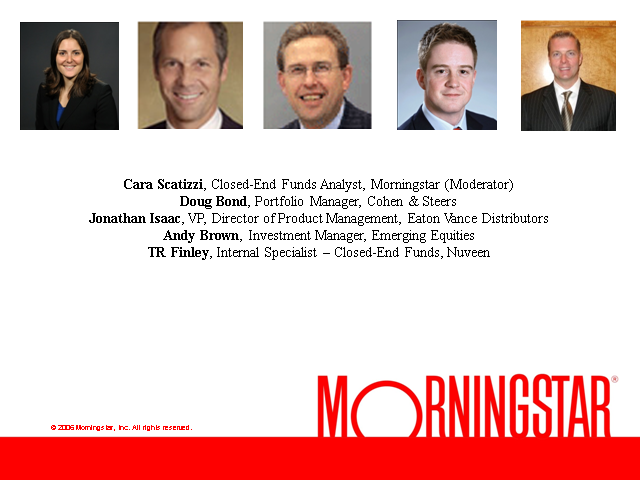 Moderator: Cara Scatizzi, Closed-End Fund Analyst, Morningstar, Inc.